Professional boxers are some of the fittest people on the planet and given the growing awareness of the importance of exercising in order to stay healthy over the course of a lifetime, it’s little wonder that gyms around the world are adding boxing classes to their offerings, and boxing-for-fitness gyms (like Title) are springing up across the U.S. The fitness-focused boxing is often known as “boxercise”. 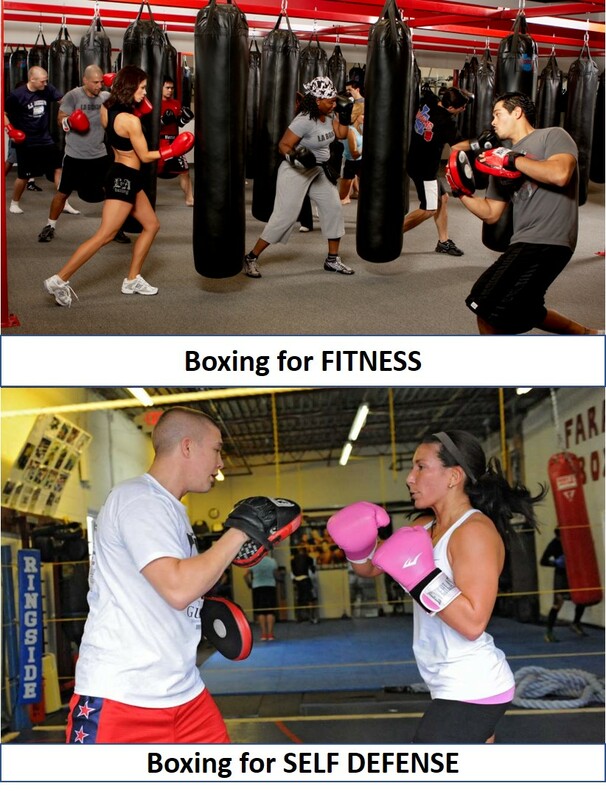 While it may seem that many “boxing classes” and “boxing lessons” are similar, their content may be very different. To be blunt, if you head to a “big box” gym, with branches from coast-to-coast then your chances of getting proper boxing training are slim. The fact is that people who offer classes at these gyms tend to be generalists and tend to create classes that suit large groups of people who may simply want “cardio-to-go”. To be clear, instructors at these gyms are usually talented professionals who are good at what they do. But again, they are typically generalists and they lack specialized skills. And even if they actually were experts in boxing, it’s unlikely that they’d have the time to teach it properly or that a big box gym would stock the sort of equipment they would need. In simple terms, big box gyms are usually fitness factories. And for the record, we mean that as a statement of fact, rather than a criticism. These businesses typically operate on the basis of providing equipment and instruction to the largest number of people in the smallest possible space and covers many bases rather than focusing on a particular niche. Putting all this together, the key takeaway is that if you go to boxing classes at one of these chain gyms you may get fit, but you are highly unlikely to develop real boxing skills. While sometimes less visible than the big-name gyms, the popularity of boxing means that there are a number of dedicated boxing clubs or boxing gyms out there. Again, however, these are far from equal in terms of the training and facilities they offer. Probably the best known chain of boxing gyms are the TITLE gyms. If you read the reviews and literature about these gyms, you’ll see plenty of comments saying that they specialize in boxing- and kickboxing-related fitness classes. This is exactly right. These classes will help you to get fit, but are unlikely to offer you the best preparation for sparring let alone actual fights. That said, TITLE gyms may be a good option for everyday practice between training sessions because there are a lot of them in convenient locations. If you want to train seriously, however, so that you can rely on your boxing skills for self defense, or even step into the ring as an amateur (or a professional), then you are going to have to find a boxing gym that supports that. Finding the right gym involves asking three questions. You want trainers who have a proven track record in the ring. Bluntly unless they’ve been there themselves, they are unlikely to be able to teach you what you need to know to fight, even for self defense. Small can be beautiful, but gyms do need to have the basics covered, namely a ring, some punching bags (heavy bags, speed bags and preferably double-ended as well) and ideally strength equipment. 3. What do other people say about the boxing gym? Reviews can be useful, but remember everyone is different so it’s always best to visit a boxing gym in person to get your own impression of it. Franklin St. Boxing Club in Chicago is small bordering on tiny. Because of this, it only has the basics in terms of equipment, but its trainers have over 30 years of experience and so really know their stuff. The 5th St. Gym in Miami has history everywhere you look and while it is popular with celebrity clients, it is very much still a serious and respected gym with all the equipment you could want and trainers who understand both teaching and fighting. Vivero Boxing Gym in Dallas may look like it was flung together out of cardboard, but it has the equipment you need and its trainers have produced a whole litany of top fighters. Church Street Boxing in NYC bills itself as the largest fight gym in NYC and it has everything you need to become a real fighter, including great trainers. Peter Welch’s Gym in Boston has hit the mainstream due to the popularity of fitness-based boxing classes, but it can still give you the training, support and equipment you need to become a real fighter.